Last night was a first at our house. The first time we’ve had an overnight guest in the 2 years we’ve lived there. And I was stupid excited about it. Not because we had a house guest in general, but because it was one of my bestest besties! As I mentioned in yesterday’s post, she’s in town for a two-day work seminar, and staying with us. Which means…cooking good food together, and making girly cocktails. Girl’s night for the win! The premise of these tacos was her idea, and we basically just made it up as we went along. And isn’t that the best? Just hanging out in the kitchen, having a grand ol’ time, and throwing together a recipe with a best friend or spouse?? And of course, if you throw yummy cocktails into the mix, that’s even better!! Tonight she wants to make the Shrimp Cilantro Burgers with Chipotle-Lime Guac that I posted a few weeks ago. No argument here!! But about these tacos. Uh…yum. 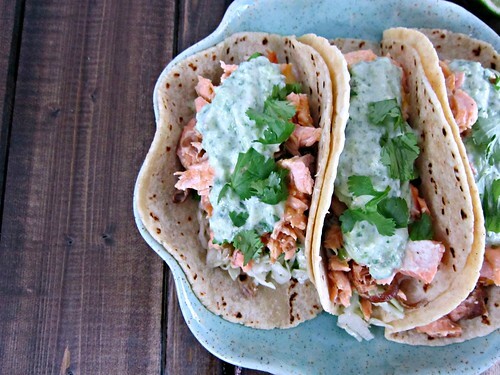 Salmon mixed with jalapenos and cheddar on top of an apple cider slaw, then topped with a creamy green sauce. Yeah. Yumalicious it sure was. And I brought the leftovers to work and ate them over a southwest chopped salad. win/win/win for me!! And also for you if you get these on the menu!! It is Taco Tuesday, after all!! Heat a skillet over medium-high heat, spray with cooking spray or drizzle with olive oil. Add the salmon fillets, skin-side down. Season with salt and pepper, to taste. Cook for 2- 3 minutes, then gently flip over with a spatula or pair of tongs. Use the tongs to gently peel the seared skin off the fillets, and cook for another couple of minutes. Now use the tongs or a spatula to start breaking up the salmon, and continue to cook until opaque. Add the diced jalapeno, stir and cook for 1 additional minute. Remove from heat and sprinkle cheese on top. Meanwhile, combine all the green sauce ingredients,except the Greek yogurt, together in a food processor and pulse until smooth. Add the yogurt and pulse to combine. Taste and adjust seasonings, if necessary. In a separate large bowl, combine the apple cider vinegar, olive oil, garlic, salt and pepper. Add the coleslaw, green onions, and cilantro, and toss to coat. 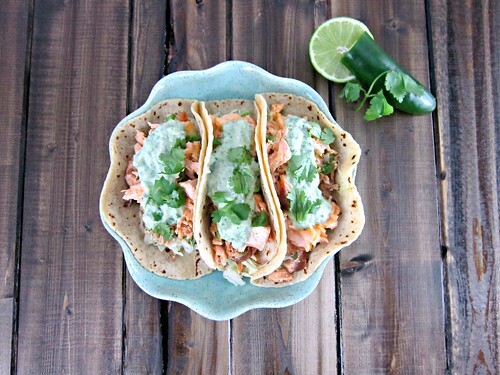 To assemble the tacos, warm your tortillas and top with a couple spoonfuls of the slaw, a generous helping of the salmon, and a good dollop of the green sauce. Garnish with additional cilantro leaves, if desired! Do you heat them up? Or just eat them cold at work? The leftovers that I brought to work to eat on salad, I ate cold. But you could heat up the salmon and then put it on a salad, if preferred! !